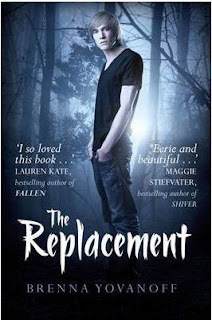 The Replacement by Brenna Yovanoff took me completely by surprise. It was sent via Lynsey's wonderful (now shut down) UK Book Tours. If I'm honest, I'd completely forgotten that I'd signed up for it at all. Perhaps I was drawn to the wonderful US cover of the book? I'm not entirely sure. When it did arrive, and I saw that it's a book about changelings, I wasn't so sure. When I did finally sit down to read it, I was really pleasantly surprised. Gentry is one of those strange towns where strange things happen but the people are so used to them, that nobody really fights for things to be different and instead go along with it. Even when babies are regularly stolen and swapped with fairy changelings. Mackie Doyle is one of those fairy changelings. Sixteen years later and he's struggling to live. I loved Mackie straight away. I loved that aside from being this fairy changeling, he's just a boy trying to fit in during high school. He just wants to be a regular teenager with regular problems and to not be noticed. Except maybe by Alice, this girl at school. But also, maybe not even by her. And instead of regular teenage boy problems, Mackie has to deal with the fact that he is dying. Allergic to iron he can feel himself getting weaker and weaker. He'd like nothing more than to hang out with his best friend or play bass and ignore it all. But when a classmate, Tate's sister is taken by this creeptastic Underground, Tate comes to Mackie for help. She wants change and a fight in order to get back her sister and all babies that are taken. But Mackie doesn't have the courage or the strength for that, but with Tate hounding him and his conscious asking him what he'd do if it were his own sister, it really spurs Mackie on to at least try. What follows are trips to the really quite creepy and disturbing Underground where Mackie must make difficult choices about who he is and where he belongs. I loved how much of The Replacement is a study into Mackie's character. He goes through so much. Avoidance and denial, his struggles with what he is. It was truly wonderful to see the creepy and unsettling town of Gentry through Mackie's eyes. He also has some incredible support on his side in the shape of his sister, his best friend Roswell and Tate. I'm not sure that I really got all of the information about the Underworld or the baby tributes because really, fairies aren't my thing at all. But I continued reading because of the strong characters and characterisations, the emotion that these kids go through and because of how sympathic and endearing Mackie Doyle is as a person. A very interesting and different book, one I'm glad to have read. I need to read this one soon. There are just so many good books out that I just can't keep up. Eeek! I couldn't get into this one at all. I know lots of people loved it, though, so glad you enjoyed! This sounds brilliant, just my kind of thing! I haven't read anything with changelings for a long long time, I wonder if this'll be a new mini trend. Vivienne - I know that problem well! Leanna - I've heard that some people couldn't find their feet with this book. I think for me, it was the right book at the right time! Jenni - Have you read other books about changelings then? ..I haven't really come across them before, but I associate them with fairies, of which I tend to avoid in books! I've been putting this off because of mixed reviews, but now reading your review, I might have to grab a copy. I like the fact it's a very creepy setting! Thanks for the review, and glad you enjoyed it :). Liz - I've only recently noticed how mixed the reviews of this have been. I completely loved it and right from the beginning too! I was surprised.